Have you ever watched your child give up too quickly and easily, moaning ‘I can’t’. Perhaps your child resists going to school because they don’t like their teacher or their friend rejected them. Maybe they failed in a sporting contest or an exam. 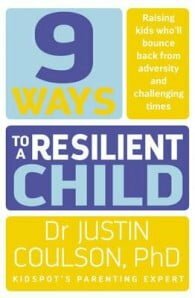 One of the most frequent questions Kidspot parenting expert Dr Justin Coulson is asked is ‘How can I help my child become resilient?’ Friendship problems, bullying, physical changes and parenting styles are just some of the issues that can affect our children’s ability to bounce back from difficulty and adapt to challenging situations. Helping our children develop resilience can have lifelong positive effects. 9 Ways to a Resilient Child will help parents enable their children to cope with the challenges that life throws at us all. Discover why winners aren’t always grinners, the problems with common advice like ‘Toughen up, princess’, the negative impact of helicopter parenting, and how praise can harm instead of help. Understand both the protective and the risk factors affecting resilience for better or for worse. And uncover the psychological secrets that will build your child’s ability to bounce back, stronger and more resilient than ever: from the ability to think flexibly, make safe and healthy choices, and exercise self-control, to the powerful impact of family, relationships, school and community. Dr. Coulson aims to bolster resilience – not just in our children, but also in ourselves. Because resilient parents are more likely to have resilient kids. Justin Coulson left school at Year 10 to pursue a successful career as a radio broadcaster. After his first child was born, Justin realised he just wasn't the dad he wanted to be. To learn more about parenting, he started studying, eventually completing a PhD in Positive Pyschology and Parenting. He now lives with his wife and six daughters in Wollongong, NSW, but travels Australia constantly, giving talks to parents, teachers and professionals. He is the author of 21 Days to a Happier Family.